Every girl likes a bad boy . . .
And Max's current boyfriend is as bad as they come. She knows her family would freak if they saw his tattoos and piercings. But Cade Winston is so perfect that Max needs him to keep playing the part. And the more they have to fake their relationship, the harder it gets to just pretend . . . 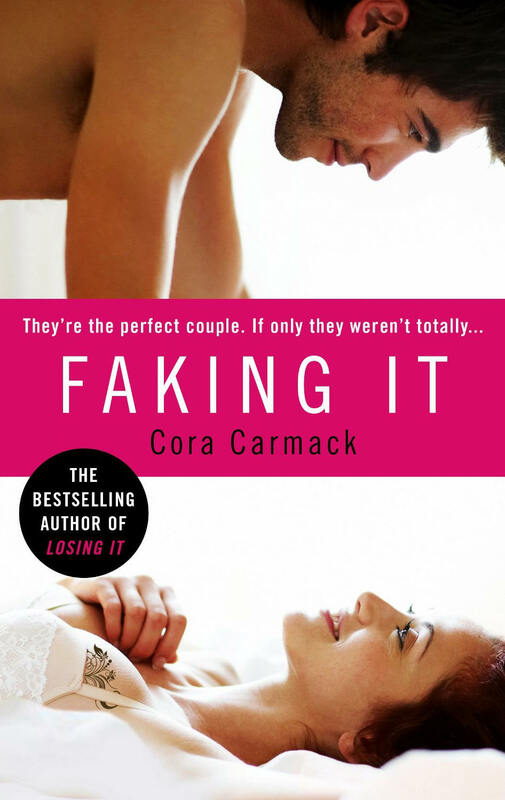 I absolutely loved Losing It when I read it earlier this year so I had high expectations for Cora Carmack's second novel Faking It. I'll admit that Cade and Max's story didn't quite have the same addictive quality to it that Bliss and Garrick's book did but it was still a really enjoyable read that I devoured in a day. I liked Cade when we met him in Losing It so although I was definitely rooting for Bliss and Garrick to end up together I was excited that we were going to see him find his own happy ending. The story picks up not too long after the last one ended and Cade has moved to Philadelphia to start his masters degree but he is still hung up on Bliss and it hurts him to see how loved up she is with Garrick. As much as he wants her to be happy he hasn't been able to move on himself and he has come to the realisation that their friendship will never be the same as it once was. Max has spent years hiding her true self from her parents, not because she is ashamed of the person she is but because she knows they will never understand her. When they threaten to cut off financial support because she refuses to give up her dreams of making it big with her band she has to resort to drastic measures to keep them onside. In a lot of ways she is the complete opposite to Bliss which is probably part of her attraction to Cade. Besides, she only wants someone to pretend to be her boyfriend to keep her parents off her back so Cade doesn't have to risk letting his emotions get involved. Well that's the theory anyway, but it turns out to be easier said than done! I liked Cade but I have to admit I was a little frustrated with him in the beginning because he was so caught up on Bliss and didn't seem able to move on with his life. I guess it was understandable though and luckily he didn't mope about for too long before Max entered his life and turned everything upside down. He quickly grows to care about Max even though they are only supposed to be a pretend couple and I loved the way he encouraged her to open up to her family and show then the real her. He cared about her for who she really was inside, not for one of the faces she put on to keep everyone else happy and that helped her gain the confidence she needed to be herself even around her judgemental family. There is a lot more to Cade than meets the eye, he isn't really the perfect guy that everyone thinks he is but he does have a heart of gold. Max was a great character, she knew who she was and what she wanted from life and wasn't afraid to put the effort in to get there. She had terrible taste in boyfriends and tended to pick men who treated her badly but I think that was a self defence mechanism to stop her from actually getting seriously involved and putting her heart at risk. It makes a nice change to read about a nice guy paired with a bad girl type character - not that Max was actually bad she just had attitude! - when so many of the books I've read recently have been the other way around. Max is a rebel and away from her parents she is confident and in control but around her family she is a completely different person. There are reasons for the way she acts around them but it takes time for them to fully unfold for the reader. I liked her much more when she was being her true self so was glad to see Cade encourage her. On the outside this looks to be a case of opposites attracting but underneath Cade and Max aren't quite as different as you'd think they are at first glance. The differences they do have compliment each other but they also have enough in common to make a believable couple. The chemistry between them was great, not quite as off the charts as that between Bliss and Garrick but definitely enough to keep me hooked to the pages. I'm very much looking forward to reading more from Cora Carmack in the future and will be adding anything she writes to my to read pile but I have to admit I'm super excited for Keeping Her a novella featuring Bliss and Garrick that is released next month! Source: Received from Ebury in exchange for an honest review.